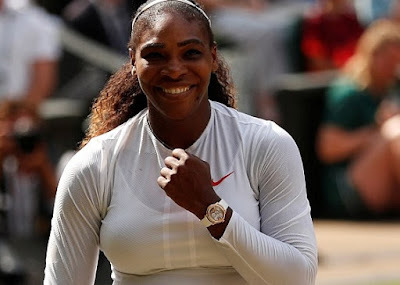 For Serena Williams, a 10th Wimbledon singles final and her first since becoming a mother. While the latter detail has provided a fascinating back story to her fortnight's campaign it has proved far from any impediment to her doing what has made her a superstar. Barely 10 months on from giving birth she is back in the final after a 6-2, 6-4 defeat of Germany's Julia Goerges that took only 70 minutes. She now meets Angelique Kerber in a repeat of the 2016 final after her comfortable victory over Jelena Ostapenko. Even at 36, this has been a seamless return for the great American, going for her 24th Grand Slam singles title.